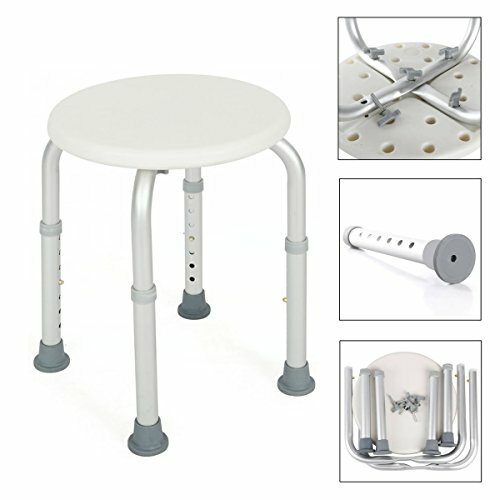 The shower chair/stool provides a safe showering solution for fall risk individuals and those who are unable to stand while using the shower. Legs are angled outward with non-skid rubber tips provide stability and safety. The tarnish resistant chair legs are height adjustable in seven levels to fit the needs of all users, which can be applied to more fields. Ergonomic design and high-quality material provide users a comfortable bathing experience. Impact-resistant composite seat with the aluminum frame, is lightweight, durable and will not rust or corrode. The parts of the chair are complete and its instruction is detailed, so users can easily understand and assemble them. High security - The shower chair provides a safe showering solution for fall risk individuals and those who are unable to stand while using the shower. Legs are angled outward with non-skid rubber tips provide stability and safety. Adjustable height - The tarnish resistant chair legs are height adjustable in seven levels to fit the needs of all users, which can be applied to more fields. High-quality and durable - Ergonomic design and high-quality material provide users a comfortable bathing experience. Impact-resistant composite seat with the aluminum frame, is lightweight, durable and will not rust or corrode. Easy assembly - The parts of the chair are complete and its instruction is detailed, so users can easily understand and assemble them. If you have any questions about this product by Apelila, contact us by completing and submitting the form below. If you are looking for a specif part number, please include it with your message.